OCNA’s longest tenured Admin, Dave Self AKA DudleyGrunt (hereafter referred to as Dave), recently worked with Amy Shoop, an interpretive Ranger at the Patuxent Research Refuge in Maryland, which is administered by the U.S. 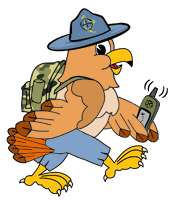 Fish and Wildlife Service, to allow virtual Geocaching on the refuge. These are the first ever Geocaches at Patuxent, as best we can tell, including Earthcaches. We at OCNA are very excited with being given this opportunity! Dave was allowed to create 6 virtual caches (which are listed exclusively on our website) in one of the 3 sections of the Refuge. The North Tract, which offers hunting, fishing, wildlife observation, trails, and many interpretive programs. The Central Tract, where the offices and study sites of the many research biologists are located at the USGS Patuxent Wildlife Research Center. The South Tract, where the National Wildlife Visitor Center and its trails are located. The South Tract and North Tract are the only areas open for visitor activities. The most obvious question is why were there never any Geocaches at the Patuxent Research Refuge? “As with National Parks and Monuments, it is illegal to place permanent caches on National Wildlife Refuges and Hatcheries. Virtual caching is a great way to experience the refuge” said Amy. We remind our readers, of course, that virtual caches have not been allowed on Geocaching.com since August, 2005. With the obvious lower traffic of an alternative Geocaching website, Dave was actually hoping that we might be able to place some physical caches, but that was not to be. Dave had first talked to a different Ranger from Patuxent in 2013 who was going to look into allowing some caches, but lost touch with him. Then, according to Dave, “Earlier in 2014 a new member of the Geocachers Unlimited turned out to volunteer there. I talked to her and she gave me Amy Shoop’s name and contact info. I started talks with her and met with her in person once. She was very excited about the prospects, but ended up determining that we wouldn’t be able to do any physical cache placements”. Knowing he had to go the virtual cache route, Dave noticed the the Refuge had a GPS adventure activity, primarily for families with children. They even loaned out GPS receivers for it. According to Amy, “This particular activity was developed by a student employee in 2012, Jessica Helmbold. It was designed as part of a Family Adventure Cart that is available for all visitors to utilize at the National Wildlife Visitor Center. The cart contains many tools that can be borrowed to explore the trails and exhibits at the refuge including adventure backpacks (that include mini field guides, indoor and outdoor scavenger hunt cards, binoculars, magnifying lenses and more), field guides, bug boxes, and the GPS Adventure activity”.